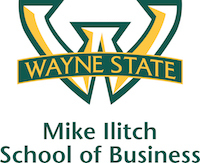 Effective Aug. 17, Marina Houghton, CPA, will become interim chair of the accounting department at Wayne State University’s Mike Ilitch School of Business. A WSU accounting and management alumna, Houghton has been involved with the Ilitch School for more than a decade, serving multiple terms on the Board of Visitors and as an executive in residence. “We're looking forward to tapping into Marina’s vast experience in public accounting, as well as her deep industry connections, to forge greater partnerships that will directly benefit our students and faculty,” said Ilitch School Dean Robert Forsythe. One of Houghton’s first tasks will be the development of a professional advisory board for the accounting department. She replaces outgoing chair Myles Stern, who joined the Ilitch School faculty in 1971 and had led the department since 2014. Stern also served as chair in the 1980s. “Myles has been a key influence in growing the reputation of our accounting program. We are grateful for his dedication and leadership over the past four decades,” Forsythe said. Stern will continue to teach Ilitch School accounting classes. Before joining the Ilitch School faculty as executive in residence, Houghton was Michigan managing partner of Baker Tilly Virchow Krause, LLP. Previously, she was the founder and president of Wolinski & Company, which specialized in providing accounting and consulting services to governmental, health care, manufacturing and non-profit organizations. Houghton was named one of the “100 Most Influential Women” by Crain’s Detroit Business in 2016 and “Top 40 under 40” by Crain’s Detroit Business in 2002. In 2003, she received Wayne State University’s Emerging Corporate Leader Award and was a finalist for the Eastern Michigan 2003 Ernst & Young Entrepreneur of the Year Award. She has served on committees for several professional and non-profit organizations, including the Michigan Association of Certified Public Accountants, the Healthcare Financial Management Association, Detroit Zoological Society, Wayne State University, Children’s Hospital of Michigan Foundation, Grosse Pointe Foundation for Public Education and Beyond Basics. Houghton received her bachelor’s in business administration from the Mike Ilitch School of Business and completed advanced studies at Harvard Business School.